Assalamualaikum wbt and good day to all. I am a bit active today knowing that Hari Raya is just around the corner. Well, although i am still not in my Raya mode as yet (we are still waiting for our Bonus news.haha) but then I can't wait for my lil bub to enjoy her first balik kampung trip! Well, looking back at the year before, i have neglected my ASB account for some reason. I think my last savings inside ASB would be in 2015. HAHA. Well, i am part of the B40 working people so to constantly making savings is quite hard. There's usually things that i wanted to buy or maybe eat at some special restaurants whenever salary is in. I have not been buying makeup items for months now. All not because i do not have money to buy, just that all those money goes back to my lil bub. My fave place would usually be Sephora, SASA, H&M, Uniqlo, LOL, MNB and all but now it is more towards Speedmart, Mothercare, Happikiddo, Butik Tateh, Manjaku Babymall. Haha. So, i have decided to continue my ASB savings back again recently. I googled and found out about ASNB online and straight away i went to Maybank to update my mobile number and address. If you do have your ASNB account previously, you can sign up to ASNB online straight away. 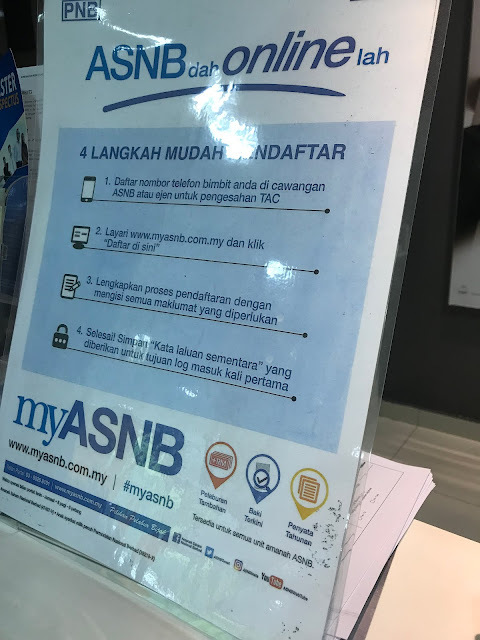 If you need to update your mobile number (cause they will be sending TAC number for registration), you can update the details at any participating ASNB agents. I just go to Maybank at Cyberjaya to update. After updating, you can straight away register for ASNB Online. You can go to https://www.myasnb.com.my/ for a start and register. Inside MyASNB, you could see the latest total investment value, you could update your personal details, you can see the yearly transaction and also could topup money in your investment as well. Super easy right! So what are you waiting for! Start to invest today! I am starting mine this month so hopefully i could constantly investing in ASB in the future.